Customize the hose by selecting a hose series and fitting configuration with the exact length needed for the job. Keep your tips operating at peak performance to always achieve the finest results. KM Coating offers a wide selection of 1/4" ID high pressure airless spray hose ranging from 3,600 PSI up to 9,750 PSI. The 1/4" ID airless paint hose is the one of the most common sizes used due to its lightweight, flexible nature and wide variety of spray coatings that can be used. These high pressure hoses can be seen applying oil based paints, latex, stains, lacquers, among several other spray coatings which is why this size of high pressure hose is used among most contractors and industrial painters. The biggest airless paint spray hose mover is the Graco BlueMax 1/4" ID by 50 foot. This 3,300 PSI is used by nearly every painting contractor due to its inexpensive nature. 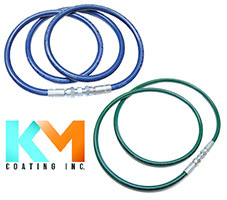 KM Coating offers a premium 3,600 PSI paint spray hose at a discounted price. An upgrade to the standard 1/4" by 50 foot and used largely with your industrial painting equipment, our PAT24 series has a higher working pressure range while providing added flexibility due to its construction. A one carbon steel wire coupled with a polyester textile fiber gives this 6,100 PSI working pressure its great strength while allowing it to be more flexible than others currently on the market. Purchase $75.00 more to waive small order fee. Why not add something from KM Coating Top Sellers. © 2016 KM COATING INC. All Rights Reserved.